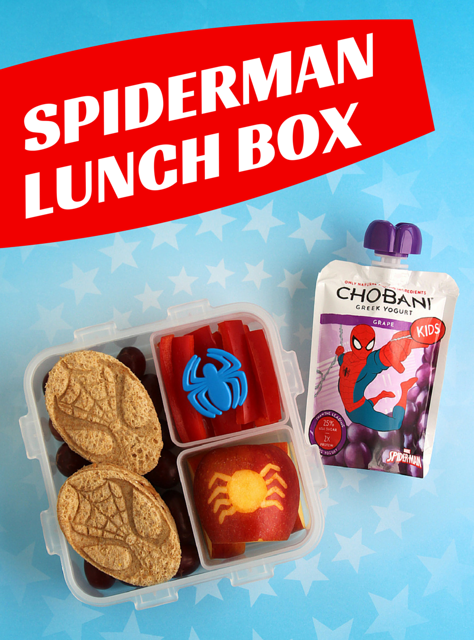 A few weeks ago Chobani asked me to make some lunches based around the pictures on their Chobani Kids and Chobani Tots pouches. The lunches were initially posted to Pinterest but I loved how they came out so much that I decided to round them all up and post them here for you to see. This skateboard lunch is one of my favorite lunches I’ve made in a looooong time! (I was so excited about this lunch that I posted a cryptic photo about it on Instagram. Ha!) I started by putting down a thin layer of yellow carrot slices, then I made two ham sandwich bears and stacked them one on top of the other to make it look like it was only one bear. The top sandwich had a skateboard helmet made out of half an olive. Safety first! The ramp and skateboard are made out of cucumbers. For sides, I added some grapes and clementine wedges with the word “skate” cut from cheese balanced on top along with a skate-themed tube of yogurt. This was packed in our PlanetBox Shuttle. 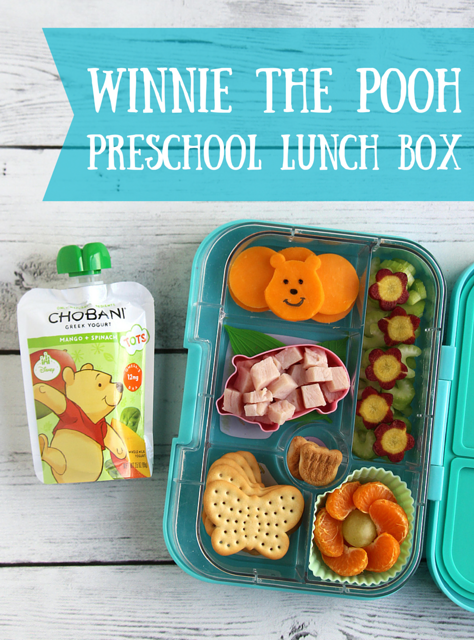 Finally, I have a sweet little Winnie the Pooh lunch perfect for a preschooler. (Though honestly I think my big kids would be equally happy with this lunch. OK, maybe the sixth grader would be annoyed if I sent him a teddy bear lunch — but the first grader would love it!) I cut a cheese sliceto look like Pooh, drew a face on it with food-safe markers , then laid it on some plain old circles of cheddar. I also added a little pig cup and filled it with ham to represent Piglet. The rest of the lunch was comprised of a Chobani Tots pouch, butterfly crackers, thin-sliced celery, purple carrots, and mandarin orange wedges. It was packed in a Yumbox . Disclosure: I was paid to create these lunches for Chobani, but I was not paid to write this post. I just liked them and wanted to share!